Something I really got into when I moved house in March was decorating my bedroom. I have twice as much space as I did in my previous bedroom and to be honest I've found it a little difficult filling it up! But I'm slowly but surely getting there and Pinterest has given me a ton of inspiration. I have since been collecting little bits and bobs to dot around the room. 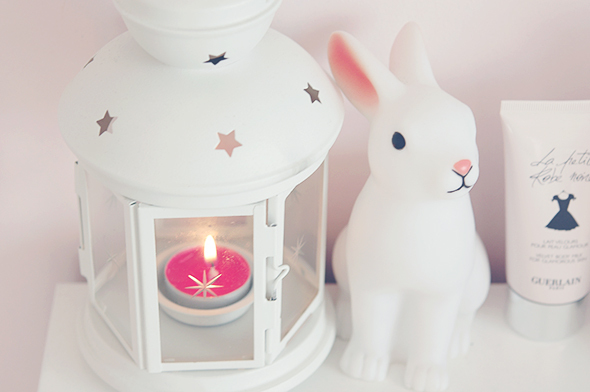 One of my favourites is the lantern tealight holder which is an absolute steal at £2.00 from IKEA. 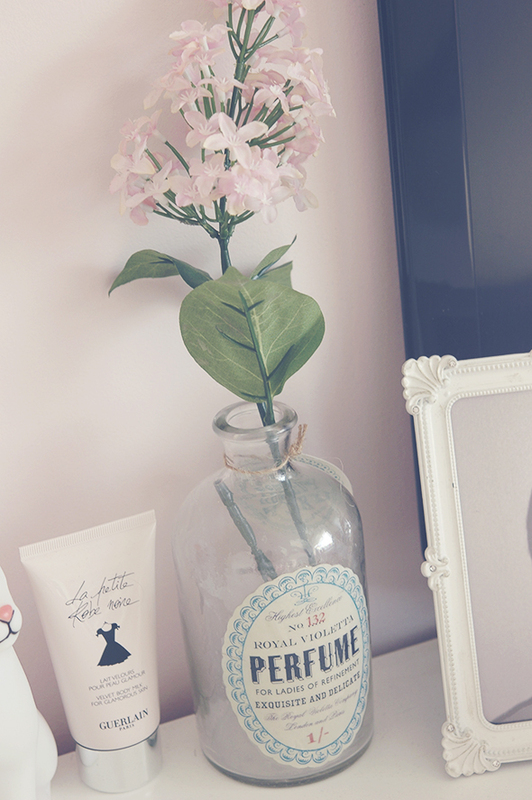 It's so pretty and once I finally get a dressing table sorted I'll be picking another up to sit on there. I bought the bunny lamp from Amazon. I'd seen it in a number of blogger's room tours and not being one to pass up something so adorable, I had to have it. It's not the brightest of lights but it looks cute and adds something to an empty space. While real flowers are pretty, I always get a bit sad when they wither and die so for that reason I prefer fakes. This bunch is from IKEA for £3.00. They're housed in a gorgeous vintage perfume bottle* from Out There Interiors, who also sell a very impressive range of French furniture. If you have a favourite place to shop for home accessories I'd love for you to send me some links in the comments! My old room was like that, had far too much stuff in it! I still can't get over how cheap it is!